With the advent of mammographic screening, non-palpable lesions are increasingly detected. As the central dogma of triple assessment is frequently regarded as the gold standard in breast lesion assessment, some form of pathological evaluation is often performed. 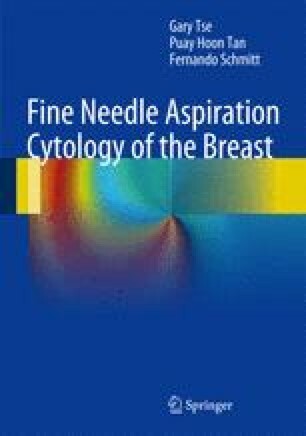 Both fine needle aspiration cytology (FNAC) and core needle biopsy (CNB) are routinely used. CNB is generally considered superior to FNAC in dealing with these clinically elusive lesions that are only detected by either architectural distortion or more commonly by the presence of calcifications. CNB, compared to FNAC, has a higher sensitivity, specificity, and positive predictive value for malignancy and lower inadequacy rate. As a result, many centers preferentially perform CNB for such evaluation, and the pure cytologic experience in dealing with these lesions are limited. In the literature, there are sporadic reports confirming the usefulness of FNAC when the clinical and radiological findings are taken into consideration.